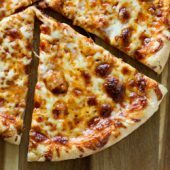 Easy homemade thin crust three cheese pizza. A classic recipe the entire family is guaranteed to love! Heat water to 115°F. Combine warm water with yeast and sugar. Allow to proof for 5-10 minutes. In a large bowl or stand mixer, combine flour and salt. With mixer running, add yeast mixture, followed by olive oil. Mix until a smooth ball forms. Knead by hand if necessary. Transfer dough to a lightly greased bowl, cover and allow to rise in a warm location for 1 hour or until doubled in size. Lightly grease a baking sheet with olive oil. Shape dough to desired size. Spread pizza sauce evenly over the dough. Sprinkle with Parmesan, followed by mozzarella and cheddar cheese. Bake for 20-25 minutes or until desired crispness is reached.